There’s no need to put up with endless barking. The GentleSpray Anti-Bark Collar gently and immediately conditions your dog to stop barking using a harmless burst of spray. The collar uses a microphone to pick up your dog’s bark, which triggers a harmless burst of spray. The spray distracts your dog from whatever he's barking at, letting you redirect your dog's attention. This spray collar is safe for all dogs, including puppies. Sound, sight, feel and scent of citronella send an unpleasant signal to dog and correct barking behavior. On/Off button to increase battery life. Water-resistant collar is for dogs over 8 pounds, fits neck sizes up to 27 inches. Collar uses 6-volt alkaline battery (included). Spray Bark Collar With Adjustable Collar Strap, (1) Refill Can Of Stain-Free Hypo-Allergenic Spray, (1) 6-Volt Alkaline Battery, Product Manual. Risk of skin damage. Please read and follow the instructions in the manual. Click here for refill spray. Click here for replacement batteries. Before playing with your dog, turn the unit off and remove the bark control collar. The activity may cause your dog to bark, which could lead to him associating the play with the burst of spray. The collar must be filled to maximum capacity before placing it around your dog’s neck. Never fill the device while your dog is wearing it because it may damage the Refill Port. To ensure that your dog does not make the connection between you and the spray collar, don’t let him see you prepare the device for the first try, or for subsequent use. Keep your dog away while you prepare the device as well as when you fill it or change the battery. It is important that your dog’s hair doesn’t block the Spray Nozzle. Try tying a bandana (handkerchief) around your dog’s neck, then place the spray collar above it. If necessary, you may also consider trimming a little of the long hair around the dog’s neck for better spray effect. Remove all other collars with metallic parts or tags. These could create noise that may needlessly activate the spraying device. Avoid letting your dog wear the device with an empty reservoir. Make sure it is always full. 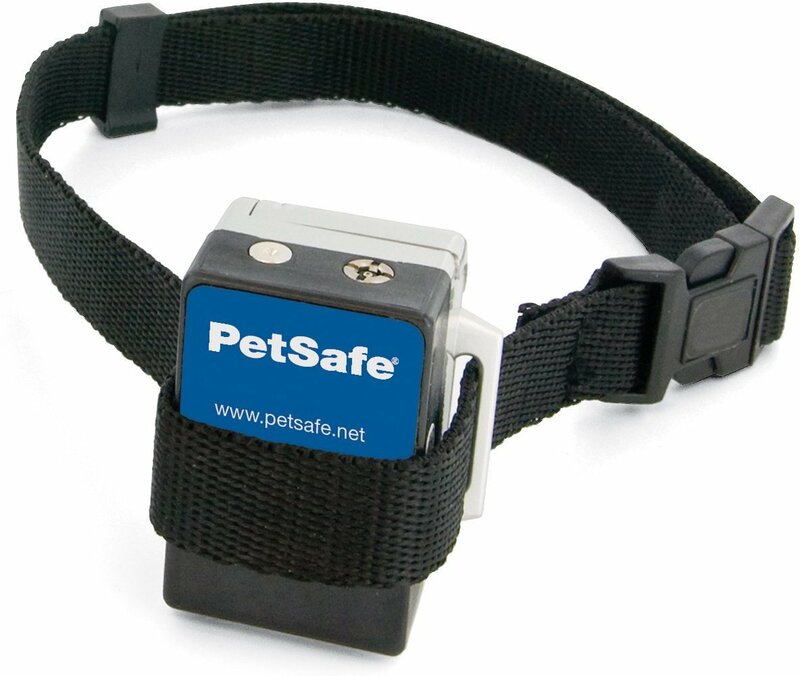 The PetSafe Anti-Bark Collar should only be used with pets that are over 6 months of age. Your spray collar is splash-proof but not completely watertight. Remove it before letting your dog go for a swim. Keep the device clean at all times. Do not immerse it in water when cleaning. Simply use a dry cloth to wipe away dirt. You may lightly brush with an old toothbrush if dirt accumulated in front of the Microphone grid. The Microphone is calibrated so it won’t be activated by nearby sounds. However, the barking of another dog at close range could cause the device to spray. Always make sure that you are not mistakenly trying to fill the reservoir through the Microphone opening. This would damage the device. Average battery life is 2 to 4 months, depending on how often your dog barks. However, due to greater use during your dog’s training, your first battery may not last as long as replacement batteries. The Anti-Bark Collar does not spray. 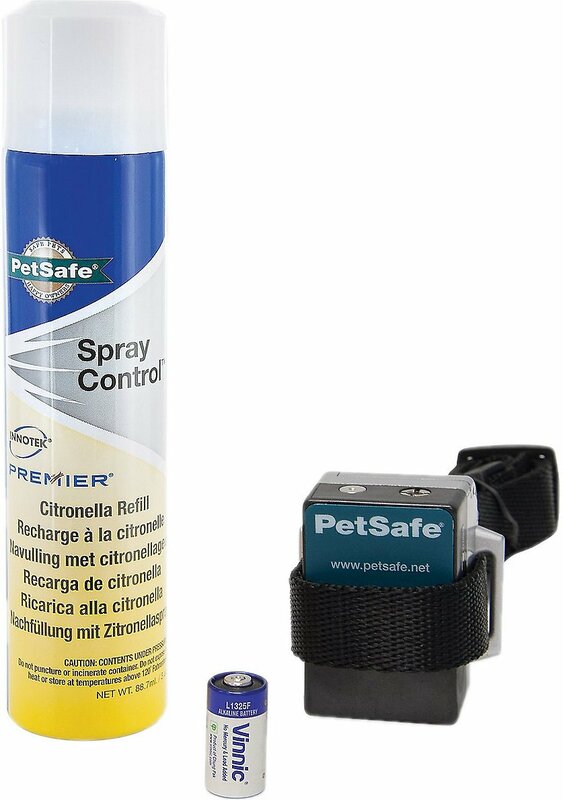 My bark control collar sprays, but my dog keeps barking. When I try to refill the Citronella Spray, the spray leaks out around the Spray Nozzle. Hold the spray can upright. If it is held at an angle, it will not create a good seal; press firmly on the spray can to create a good seal. Will this work with long-haired dogs? Yes. It may be necessary to trim the hair on your dog’s neck so it does not block the spray from reaching his snout. Does the spray need to hit my dog’s nose? No. The spray is very fine and simply creates a mist in the region of the snout. Will my dog stop barking completely? The bark control collar effectively and humanely stops most barking when it is worn by a dog. It should only be worn whenever you don't want your dog to bark. Your dog’s reaction to the collar in terms of their barking will depend on your usage of the collar and the temperament of your dog. A bark collar helps you communicate to your dog when it is okay to bark and when it is not. Some dogs will be trained quickly and as a result may not need to wear the collar long term. Other dogs associate not barking with the collar and will only control their barking when they have the collar on. PetSafe collar hushes a schnauzer! Our sweet dog is a terror at the door. The anti-bark citronella collar works perfectly but has a surprising side effect. The collar hushes her right off but then keeps her "humbled" (upset? timid?) for hours thereafter. I'm accepting this temporary personality change since her crazy barking was driving me crazy. FYI: We put the collar on only when we think someone is expected, and then take it off soon after. We also hide it from her view as best we can. Very sensitive and not a fan!!! I bought 2 of these collars for my dogs since I live in a apartment complex and my dogs have never lived in one before so they where barking a lot. So I was told this was the best way to get them to stop barking without shocking them. So I notice this collar will continue to spray even a few minutes after my dog is done barking. Not a fan and will be returning them. Snorkie is designer dog (Yorkie/Schnauzer), but he is all Schnauzer - bitey/barkey!!! First day I tried the collar for 10 minutes, he flew to me between my legs and trembling 15 minutes, but barked only 2 barks that day. Yesterday, he wore it all day outside and when I came home from work, no riotous barking as usual, but was calm. He has already associated the collar with can't bark. Now, all I have to do is hold it up and say, "Do I need to put your collar on?" And, he just cowers down. I am using it gradually and giving him times when he can bark. He is much less aggressive also; it is modifying his big personality. Thank you! Thank you! Thank you! This has been helping quite a bit. My only recommendation would be less amount of the spray. Due to the fact when he barks it's ongoing for a few minutes, the whole house gets to smelling and it builds up quite the residue. But it is helping a lot with his barking. My opinion on this is still up for grabs. Maybe my dog is just strong minded but she hates to get sprayed with anything and yet she still hasn’t quit barking. I think the product is doing what it is supposed to do some of the time but not all of the time and even then my hard headed barking dog has not shut up. Hope this helps someone out. I put this on my Min Pin, a major barker. It worked wonders...for 1 1/2 days. I did all of the troubleshooting, then called the company. They shipped another one out to me, but it never worked. If I could get one that worked, I'd be thrilled, because my dog really responded. This product is exceeding our expectations and is perfect for our setup. Read the instructions. Remember to refill citronella and change batteries when needed. Do not set the dog up for failure by using the collar in an overly stimulating environment. I was worried about getting an anti bark collar for my dog. But once I saw this one, I felt a sense of relief. I course he gets a little scared when he barks and the sparky comes out and hits his nose. But I find this product to be a lot more safe for my dog opposed to a shock collar. I would definitely recommend this product. Not getting enough longevity from the device.